The monolayer forms a covalent bond with the surface, resulting in high abrasion resistance. At Surfactis Technologies we have developed a proprietary and patented family of molecules that are capable of binding to a surface in a self-assembled monolayer, altering the surface’s properties. These coatings, which are nanometrically thin, demonstrate hydrophobic and oleophobic capabilities and are suitable for use with a wide range of materials, including metals, alloys, ceramics, glass and polymers. All our coatings are invisible and boast outstanding resistance to abrasion, chemicals, pH conditions and physical abrasion. Hydrophobic and oleophobic coatings dramatically reduce surface energy and wettability, resulting in extremely high contact angle measurements across a range of liquids, both polar (water or organic solvents, for example) and apolar (such as hydrocarbon or oil). Surface energy represents a surface’s ability to interact with its environment, and is calculated by measuring the contact angles of at least three known liquids. Contact angles (θ) are measured using a cross-section of a droplet on a solid surface. The angle θ between the outline of the droplet and the point at which it meets the solid surface is the contact angle. For a water droplet, the higher the θ measurement, the more hydrophobic the surface is. Superhydrophobic surfaces are extremely hydrophobic, which means they are exceedingly difficult to wet. 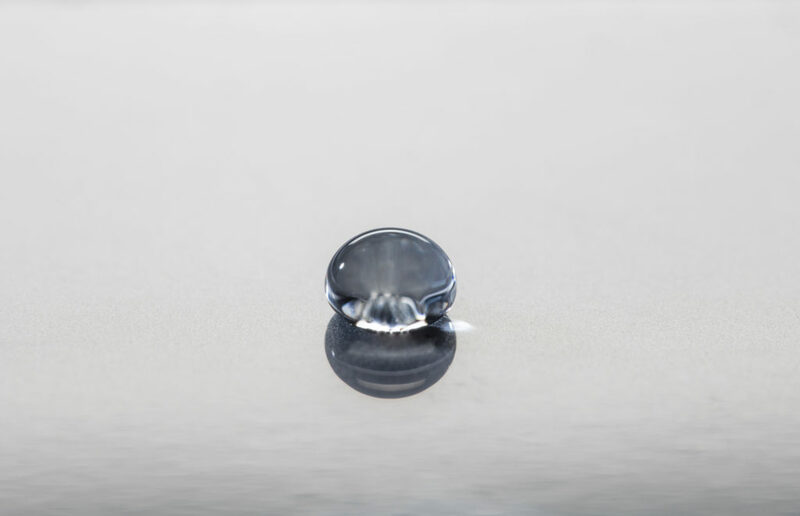 The contact angles of a water droplet on a superhydrophobic surface exceed 150°. Tilting the surface to as little as 10° from the horizontal will cause the droplet to roll off. Adding a superhydrophobic coating makes a surface liquid and water repellent, easy to clean, and boosts its anti-icing performance. Lotus leaves provide a natural example of superhydrophicity, known as the “lotus effect”. Water droplets that fall onto their surface simply bead up and roll off. This kind of surface can be so water-repellent that droplets actually bounce off like rubber balls. Superhydrophobic surfaces are obtained by using a hydrophobic material that also has a specific surface roughness. Surfaces that meet both criteria are extremely difficult to wet. A droplet deposited on the superhydrophobic surface is submitted to vertical forces (gravity or external pressure), causing it to fill any gaps between the asperities. When this happens, the contact angle remains high but the adhesion force dramatically increases, meaning the droplet has difficulty rolling off. With this type of surface, both the roughness and the level of hydrophobicity are sufficient to withstand the vertical forces exerted on the droplet, meaning it does not get pushed between the asperities. The droplet appears to be floating on a cushion of air, and the slightest tilt of the surface will cause it to roll off. Cassie Baxter is the preferred state for anti-icing, self-cleaning or water-repellent surfaces.